Over the many years we’ve been introducing brand-new jumpers to the sport and art of skydiving, we’ve noticed a trend. When it’s a sunny day but the wind is blowing too hard to safely make a skydive, a lot of skydiving students and first-time jumpers get frustrated. Why on earth, they mutter, Aren’t the planes going up? It’s gorgeous out! It’s a beautiful day! We love the sunshine, too, and we absolutely understand the feeling: It’s super-important, however, to stay on the ground when the winds are blowing hard or, even worse, are gusty. You don’t want to be up there, wishing you weren’t! Here’s why. 1. The Air Up There Is Different Than The Wind At The Landing Area. Even if the air on the ground seems to be well within spec, a dropzone will be looking at weather reports to assess what the winds at altitude are doing. There are usually several different “layers” of wind, and they may be going at vastly different speeds and in totally different directions. Google wind shear to learn more. 2. The Upper Winds May Be Moving Even Faster Than the Air Below. More along those lines: the winds at altitude, since there’s no terrain to slow them down, might be blasting. If the winds up high are pushing super-hard, there’s a risk that skydivers may be blown off-course and required to make an emergency landing somewhere sketchy they didn’t intend to land. This isn’t fun stuff even for a sport skydiver, but no responsible tandem operation would willingly put a tandem instructor and her/his charge in that kind of danger. 3. The Landing Is The Most Important Part. Even if the winds don’t push a tandem pair off-course, high winds cause a lot of ground turbulence at the official landing area, creating very dangerous rotors in the airflow as the wind blows over obstacles like buildings, trees, fences, etc. If the parachute hits one of these rotors, it could theoretically drop the tandem pair like a trapdoor. We’re determined to not let that happen on our watch, so when the risk factors are there, we call a weather hold and wait for skydiving conditions to improve. 4. Patience, In Skydiving As In So Many Other Things In Life, Is The Way Forward. If weather is inappropriate for a great skydive, we cheerfully reschedule for a better day. We want you to have the safest, most enjoyable skydiving experience possible, after all! It’s our duty to ensure safe conditions abound, before allowing you to leap from a plane. 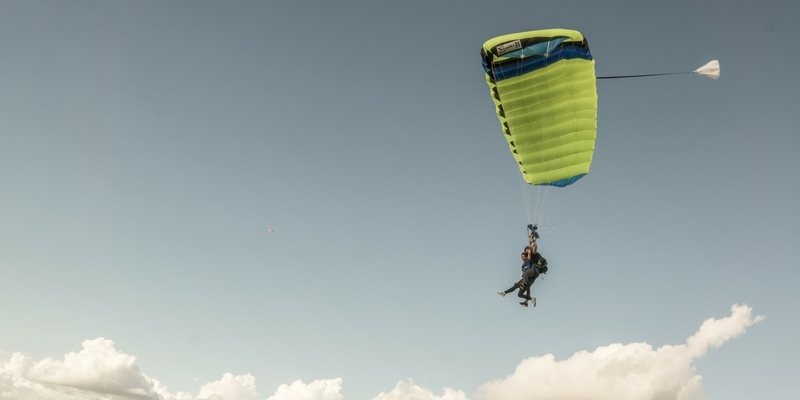 Read more about How to Prepare for Skydiving & 6 Things You MUST Know Before You Go.